I knew I had a difficult task. I obtained or had access to all the Royal Caledonian Curling Club Annuals. to membership since that meeting. the number of regular members and occasional members. 22 Regular and 59 Occasional Members. Lt-Colonel Forrest was the Laird of Haremyres. James Strang of the Peel Thorntonhall. Rev. A. R. Storry was the Minister at Carmunnock. Andrew Strang was James Strang's son. and held office till 1883 when James Osborne was appointed. when William Strang of Bosfield was appointed. my grandfather was the secretary from 1895 untill 1915.
of the Haremyres Curling Club as possible. resident in the western side of East Kilbride Parish i.e. Thorntonhall and Busby. and Mrs Macaulay the tenant of Haremyres Farm. Colonel Forrest was elected Patron. William Strang of the Peel President. Rev. William Jack M.A. Chaplain. A committee called Directors, was also elected. and the Vice - President one prize to the winners of the Punch Bowl. to commemorate the Diamond Jubilee of Her Majesty Queen Victoria. The Directors to arrange the conditions of play. also a rink to the Scotland versus England match. consisted of 31 Regular and 34 Occasional players. was paid by Andrew Strang who had been Secretary. and he had waived the debt to him owing to the lapse of time. with 28 unpaid subscriptions. The subscription was five shillings. when the Club won by 38 shots in a four rink game. Cathcart, Paisley Boreas and Thorniehill. Before 1899 the Club had a predominant membership from East Kilbride. The pond gave considerable trouble to the Club. and were used to build up the rear of the wall at the overflow pipe. At the same time it was "puddled" well with clay. be in the hands of the President, Vice President, Secretary and Treasurer. and the erection of a barbed wire fence round the pond. but the latter was not implemented as there is no further record of it in the minutes. residing in the neighbourhood rather than in Edinburgh. and kept amongst the other Club trophies. and that there was sufficient room for names on his handsome Punch Bowl. was played on 9th December 1902, and the final on 13th January 1903. The Grand Match at Carsbreck on 16th January, 1903, is referred to. There was no playing ice during seasons 1903-04, 1904-05 and 1905-06.
and was won by Christopher Strang of Duncanrig, who received a medal. 1898-99 John Baird, 1899-1900 John Hamilton and 1901-02 George Warnock. and Skip John Hamilton, they lost by six shots to No. 4 Rink London Caledonia. and Â£9 15s 8d to the Treasurer, Mr Crosbie. and see Mrs Macaulay if the pond rent could be reduced. the committee to appoint players. and confirmed that the pond rent could not be reduced. if sufficient arrears were not collected to meet the debt. for the Royal Caledonian Curling Club Medal and won by 20 shots. and it is assumed that this was at Crossmyloof since it was so early in the season. that non-members playing on the ice be charged 1 shilling. a pair of curling stones and handles for the points game. for the Club Championship at Crossmyloof. Some members entered a rink privately for various competitions. and in 1912 it won the Masons versus Bowlers competition. at Crossmyloof when 414 rinks played. This was the one and only time it was played in an indoor rink. Haremyres lost by five shots over four rinks. when the Club had a majority of 16 shots. with arrears of Â£5, all considered good. for the Glasgow versus Ayrshire match at Crossmyloof. which the Club won by five shots. to guarantee aid to Crossmyloof Ice Rink during the war. After discussion, 13 members agreed to be guarantor's to the sum of Â£67. it was agreed that the Club donate Â£5 to the local War Work Party. and it was agreed to ask his eldest son William, to fill the post. A request was read from the "16 Curling Club"
as the Crossmyloof Ice Rink was now closed. and hoped they would be able to take advantage of this gesture. in order to commemorate the Diamond Jubilee of Her Majesty Queen Victoria. to hand it over to the President as a keepsake and heirloom. to be used as the Directors thought fit. This new medal became known as the Haremyres Medal. 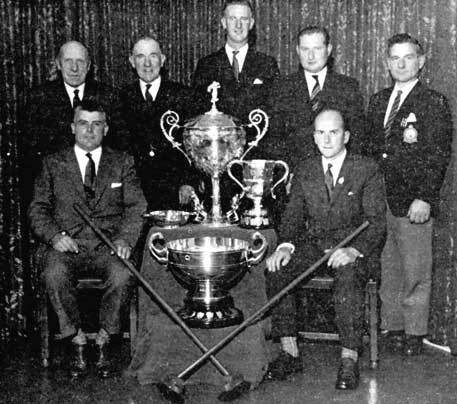 The Haremyres Club joined the Lanarkshire Province Curling Club in 1920.
to build a hospital, now became the landlord of the pond area. also other persons authorised by the Council, could have the use of the pond. at Edinburgh Ice Rink on 14th January 1921.
which had been in existence since the formation of the Club. and preventing the ice forming sufficiently to enable curling to take place. when the Punch Bowl was played for. and store them in Mr Garroway's premises at East Kilbride. the money to go to the Club funds. Mr Garroway did this and altogether Â£8 10s went to the Club funds. when the business was "the consideration of play at Crossmyloof". and had taken over the premises of the original Crossmyloof Ice Rink. and the members unanimously agreed to use Crossmyloof for play. The Secretary reported that he had booked two rinks there. and would enable them to curl early on in the season. and investigate the cost of the repairs. Mr Gilmour was instructed to see that the necessary alterations were carried out. He guaranteed that the alterations would not exceed Â£25. Unfortunately this pond was never played on. when Haremyres won by 31 shots. that the Club should amalgamate with the East Kilbride Club. the Club to be known as the East Kilbride and Haremyres Club. the Match Committee to make arrangements for further play. to be held in the New Year's week and authorised to pick his own rink. commencing on Tuesday 11th February, and every second Tuesday thereafter. also a Curling Supper to celebrate the Centenary of the East Kilbride Club. Tickets would cost 5s each. This is the first mention of a court being held in the Club. when 24 curlers were "made" by Mr Peter Robertson of Dalmuir. Mr Garroway the President, presided over a large audience. as a provincial member and to play in their competitions. the rink skipped by T. B. Begg was successful, being 23 shots up. asking the committee to consider the forming of a tar-mac rink. who was interested from a tennis point of view, and ascertain his opinion. This project, which was to be in Graham Avenue, did not materialise. Thomas Neilson won the Club Championship at Crossmyloof. which was won by the Lanarkshire Province. and again in 1934 with a 17 shots majority, T. B. Begg being skip on this occasion. skip in the winning rink. This win was repeated in 1934 with an average of 11 shots over three rinks. T. B. Begg was skip of the highest up rink. and that he would do so at the Curling Supper. The medal was renamed the Dunn Medal. with James Barr James Mitchell and Hugh Begg. a gift of four silver quaichs to the winners of the Dunn Medal. Unfortunately this donation did not materialise. and he and Archibald G. Gilmour reached the final of the Open Pairs. the Secretary was granted an honorarium of Â£4 4s. This was the first time a Secretary had been so recognised. skipped by Thomas Neilson and Robert Dickie. should be deposited in the Clydesdale Bank for safe keeping. of the 1939-45 war and the Scottish Ice Rink was again open for play. the skips being Arthur Gilmour and Robert Dickie. for annual competition in memory of his father, the late Thomas Neilson. 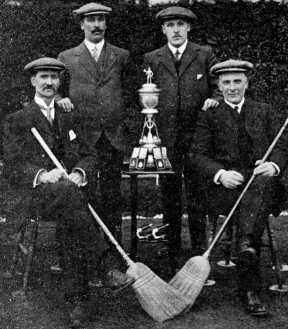 The trophy was to be known as the Thomas Neilson Memorial Trophy. Thomas Neilson was a prominent and beloved member of both clubs. Certain agreeable conditions were laid down. and each game was to consist of six rinks. and the Secretary was instructed to write and thank him. that he was arranging a game of four rinks with John D. Brown of Biggar. and a meal was to be had after the game. An annual game was instituted with the Blantyre Club. This was similar to the Biggar game but always to be played at Crossmyloof. for competition at the Annual Game which was being held on 15th January 1949.
and to write to Mr Walker personally expressing the Club's thanks. a Curlers Court at Crossmyloof on Thursday 11th November 1948.
were to finalise the arrangements. when 51 members and 14 guest's attended. and Charlie Gray and Bill Stott his assistants. Bob Harris acted as TheDoctor in case of accidents. The East Kilbride members went home by bus. put on the present memorial and it was agreed to donate Â£5. 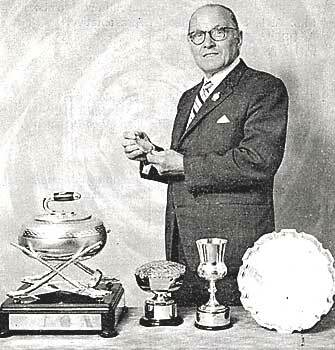 From the season 1948-49 the competitions were played on the league principle. This gave each player more games although more curling was required. An inter-club game was initiated with the Hamilton and Thorniehill Club. and the Hamilton president, William Robertson-Aikman Esq. and said he would give a trophy for annual competition between the clubs. but a counterproposal was tabled for the status quo. After a vote the motion was carried. when the competitions were played on the league principle. and the Secretary submitted an idea of his own which was drawn by A. J. Eustace. with one for the President and 12 for Ex-Presidents. 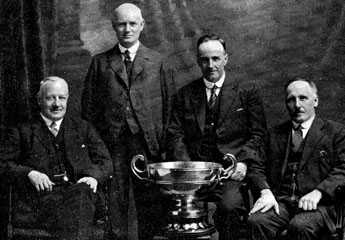 and five members represented the Club. During the season 1952-53 the Club played five inter-parish games and won four. Biggar was the only game lost. 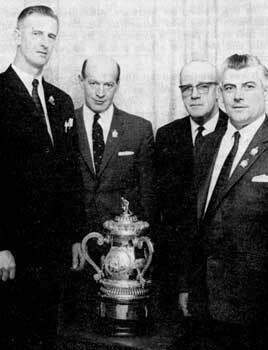 The Club won the Thomas Neilson Trophy for the first time. The Lanarkshire Bonspiel was also won for the first time. on behalf of the Scottish Ice Rink Club. but only two rinks were accepted owing to the popularity of the entry. and Â£1 to each of the Auldhouse and Jackton committees. took place on board the pleasure steamer "Maid of Argyll"
during the run from Craigendoran to Rothesay on 26th August 1954. Cattle Show Society and the East Kilbride Branch of the National Farmers' Union. full advantage was taken. Len Hamilton, the Vice-President, presided. as had been agreed at the Annual General Meeting on 26th April, 1954. The order of play in the Dunn Medal was altered, making the Club skips play lead. This gave the third players the chance to skip and gain some experience. after 10 years during which time the Club had had some very successful seasons. and included in this team were President J. Cassels Pinkerton and Arthur Frame. and Allan Steel represented the Club in one game. Brigadier J. H. W. Gow, and Mrs Gow, were the principal guests. Robert Dickie very kindly donated a cup. when the Club was represented by two rinks. and skipped by Hugh Begg lost in the final to J. Hutchison of Kirkmabreck. A happy occasion took place at the Dinner-Dance on 26th April 1961.
presented them with a miniature granite curling stone suitably inscribed. Hugh Begg intimated his resignation as Secretary and Allan Steel was appointed. Hugh received a token of appreciation for his services. and the various competitions taken part in with even greater enthusiasm. and have a syllabus printed so that members could have it with them at all times. a danger of a take-over and curling would be lost for ever. but curling was continued, thanks to the fight put up by the original Scottish Ice Rink Club. but was fully answered by the President who had quite a lot to do with the negotiations. it was agreed to have a points competition and this was held over two rinks 27 players participating. the Neilson and the Walker Chalice. the question of a Constitution for the Club was brought up and discussed. It was ultimately left over so that similar constitutions could be studied. and finally ratified at the Annual General Meeting in April 1966. An ice rink having been built at Hamilton in 1967 "The Lanarkshire Ice Rink"
and it was decided to ask for 20 sheets for curling in the coming season. agreed to enter a rink and a ladies' rink in the Ladies' League. for winners' names was discussed as all the available space had been used. as to how this could best be accomplished. to take the winners names. for meeting the cost of this alteration. They were thanked at the Annual General Meeting in April. At this meeting the Secretary, Allan Steel, intimated his resignation. Allan was thanked for his sterling work during the past seven years. In appreciation, he received a wallet of notes and Mrs. Steel a gold brooch. Andrew Bryson was appointed Secretary. presented a salver to be competed for annually in a points competition. This was to be known as the Duneaton Salver. but who did not get much curling other than in the Club's competitions. To this end a meeting was called at the home of Mrs. R. Hinshalwood, Kirkton Mains. Sixteen members attended, with the President, James Craig, in the chair. Accordingly it was agreed to form a Ladies' Section since they had the support of 27 ladies. Mrs. James Craig as Chairwoman and Mrs. Hinshalwood as Secretary. It was agreed to book one sheet of ice per week at Hamilton. and to be known as the Hamilton Rosebowl. This was won by the rink skipped by Mrs. A. L. Scott. A request that the Club trophies should be valued at present day values was carried. the Dunn Medal, Â£50; the Robert Dickie Trophy, Â£60; the Duneaton Salver, Â£75. The new premium for insurance was Â£3 5s. the rink skipped by James Craig was successful. The rink included Andrew Bryson, William Allison and Allan Steel. is the major competition at Crossmyloof.